As a public service, Colel Chabad publishes an annual Jewish Calendar that features all of the established customs and practices of Jewish life according to the traditions of Chabad-Lubavitch. We are pleased to bring you the entire calendar to help you plan and enrich your Jewish life. 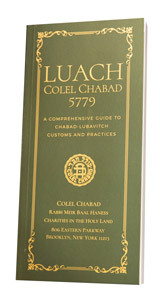 To download and view the Luach of 5779, click here. The information published on this website is the property of Colel Chabad and is provided for individual and personal use only. Unauthorized reproduction, distribution or sale of any portion is prohibited.